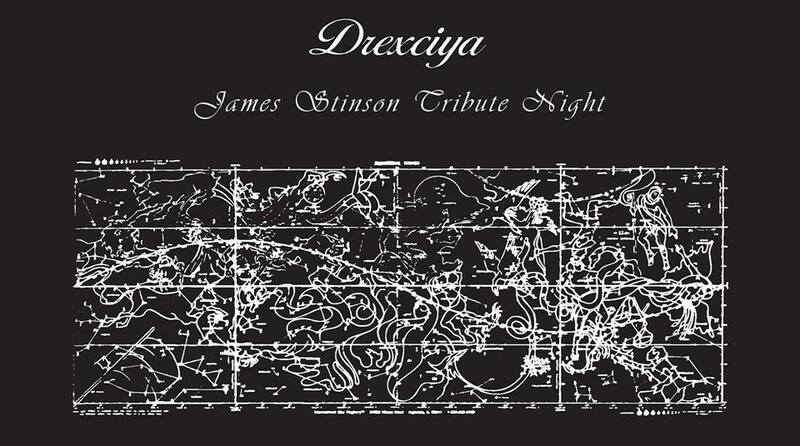 There are now 5 confirmed James Stinson/Drexciya tribute nights. 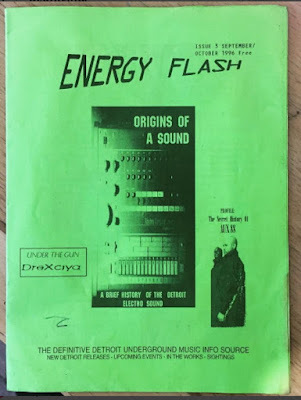 There is one in London on 2nd Sept, Manchester on 2nd Sept, Rome on 2nd Sept, on 4th Sept an online radio show, Teknology based in Detroit, one in Birmingham on 7th and one in Dublin on 8th Sept. I've edited together a video that might be useful to project as visuals in case anyone wants to use it. This year will be his 15th anniversary and fans have taken it on themselves to do something to mark this. I hope they all go well and if you can't get to go to one maybe just listen or share some of his music instead. There is a new Dopplereffekt live show announced for 28th October in Manchester, England. Das Heise Experiment 2 - The Prequel by The Exaltics has shipped. Heinrich Mueller, under his Rudolf Klorzeiger alias, collaborated on one of the tracks. The picture disc is limited to 500 copies and is sold out on Bandcamp but in early September copies will also be availble in stores. You can still order the digital album and listen to samples at this link. The Ocean After Nature touring art exhibition, which features artefacts of Drexciya alongside work by The Otolith Group and many more reaches Dublin City Gallery The Hugh Lane in early September. On 6th September at 5pm there will be a talk by its curator Alaina Claire Feldman followed by its opening reception. The show runs until 7th January 2018. 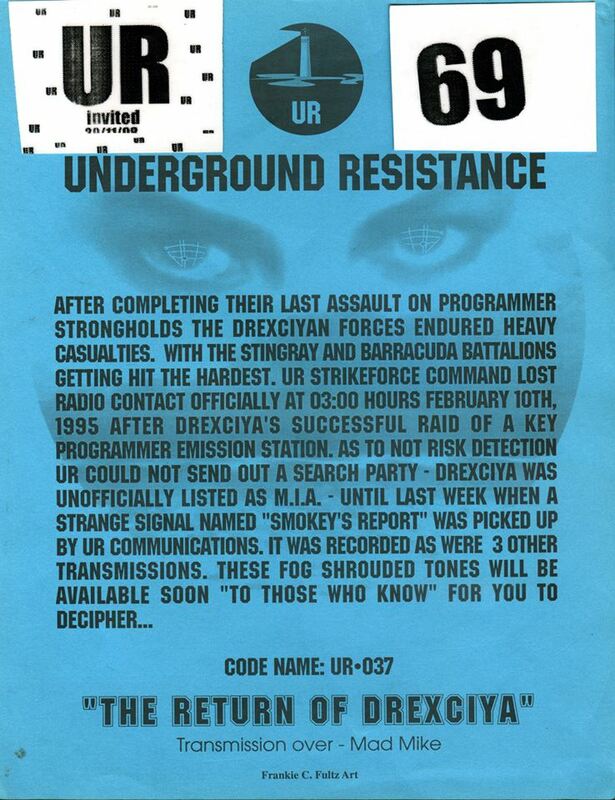 I've been kindly sent some images from the RubaDub/Club 69 archives. 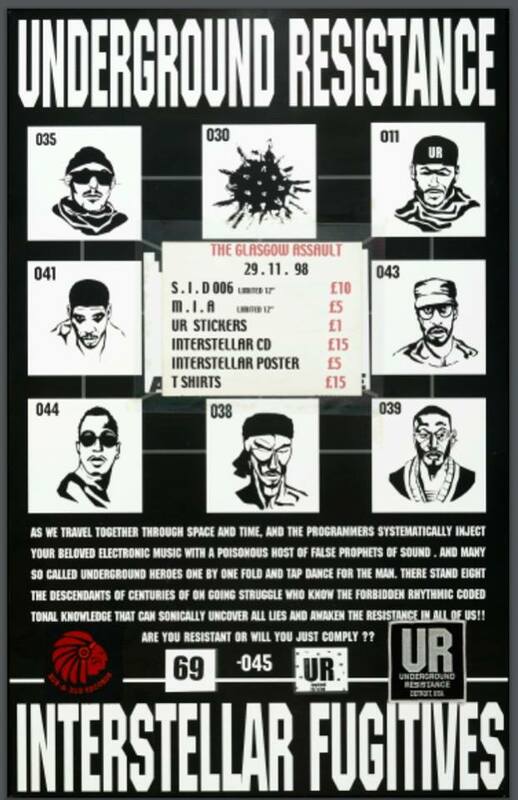 The first image is a very rare poster from Underground Resistance's Interstellar Fugitives tour, which only touched down in Paisley and London in November 1998. 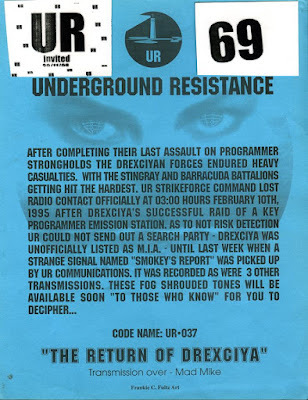 The second image, an adapted piece of Drexciya insert artwork, served as the ticket for the night. I don't think they have been shared online before. The poster was designed by Mad Mike himself. 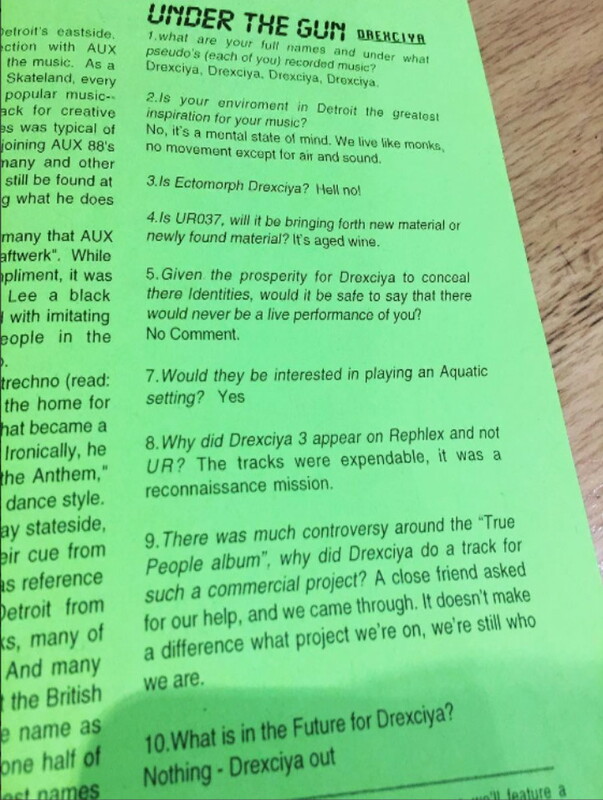 Also originating from the same archives, on an Instagram account of Mark from RubaDub, I've previously shared this Drexciya Q&A from Energy Flash zine from 1996 on DRL before, but this is the first time I've seen the original pages. This is an excellent and extensive piece by Daniel Montesinos-Donaghy about The Other People Place's Lifestyles of the Laptop Cafe. Some interesting interviewees (including me) and the story behind the $25,000 copy on Discogs, its iconic artwork and more. The article has been up since February but I only saw it. A new live show has been announced for Dopplereffekt in Hamburg, Germany on 18th August. There is a very exciting new project and concept, Music For The Other People Place, from Fundamental Records. Inspired by the spirit of James Stinson, you can read all about it at this link and sample some of the forthcoming music. Fundamental always do amazing projects so I'm sure this one will be very special too. You can listen to the new NRSB-11 track, 'Nationalised', from Kern Vol. 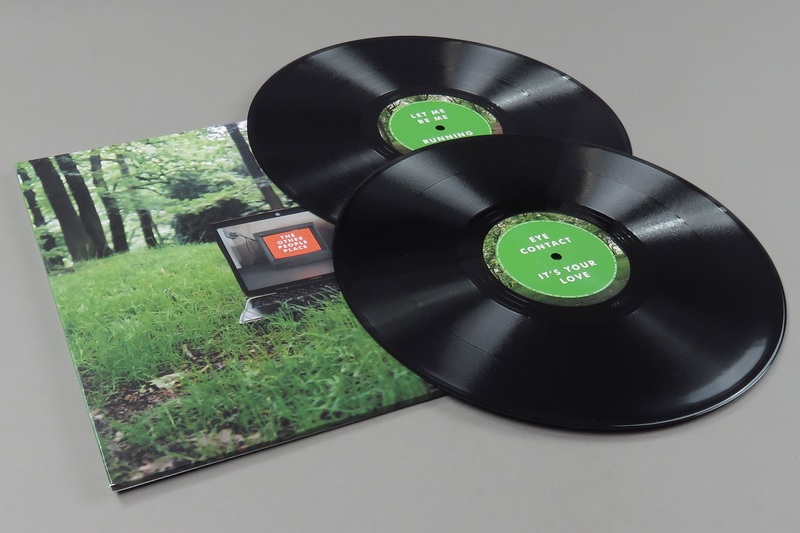 4 on Tresor, which was selected and mixed by DJ Stingray 313. Previously this has been a collaborative project involving DJ Stingray, Heinrich Mueller, Penelope Martin and others (not sure of current lineup but guess Stingray and Mueller are still involved). Their debut album, Commodified (2013) on WeMe is well worth hearing too. This radio show is the first of the James Stinson 15th anniversary events to be confirmed. I'm aware of 3 others in the works and will share them once they are finalised. 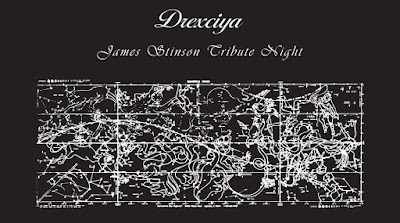 If anyone is interested in doing a small tribute/celebration of James Stinson/Drexciya in a bar, club or online on or around the 3rd of September I will be happy to share.